I’m not going to lie: I love the idea of granola bars. 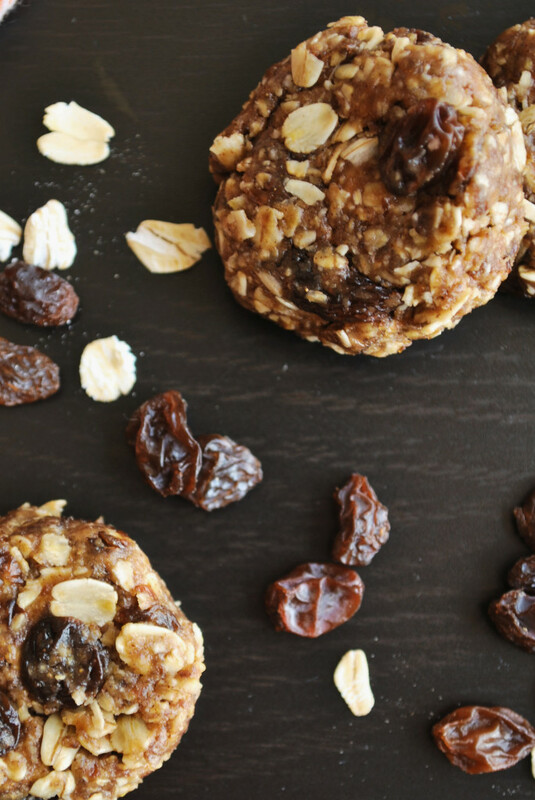 They’re a quick and easy, go-to snack that can be made with healthy whole foods. That being said, I am so not a fan of the whole execution of the lowly granola bar. One of my favorite things about a whole foods lifestyle is that I can eat in volume. I’ve always been a huge snacker, and I truly do love to eat. I’ll grab handfuls of carrots, a side of salsa, and a giant apple for a snack and be happily munching for a half hour. When I can sit myself down in front of a 5 lb. salad and go.to.town for dinner, I’m a very happy girl. Granola bars are sort of like a one-stop shop. I can eat one of those delicious, calorically-dense bars of goodness in like three bites, max. While I love the flavors, textures, and chew, granola bars just aren’t the ideal snack for me. Instead, I have decided to treat granola bars as…dessert! While I still can get that oaty, fruity flavor fix from these No Bake Granola Bar Cookies after dinner, I don’t need to devote my entire cherished snack time to a simple bar. These No Bake Granola Bar Cookies literally take five whole minutes to throw together, and I can guarantee you that you will be in texture heaven with just one bite. I love the short ingredient list for these No Bake Granola Bar Cookies; when it comes to summer, I always live by the motto, “the easier the recipe, the better!” I threw some oats, raisins, tahini, cinnamon, and pure vanilla extract into a blender and blended until it resembled a granola bar. I love the chewiness of the oats paired with the sweetness of the raisins here, and the tahini adds some necessary richness to these dessert cookies. It’s textured perfection at it’s finest, peeps! And seriously: that’s all there is to this recipe! 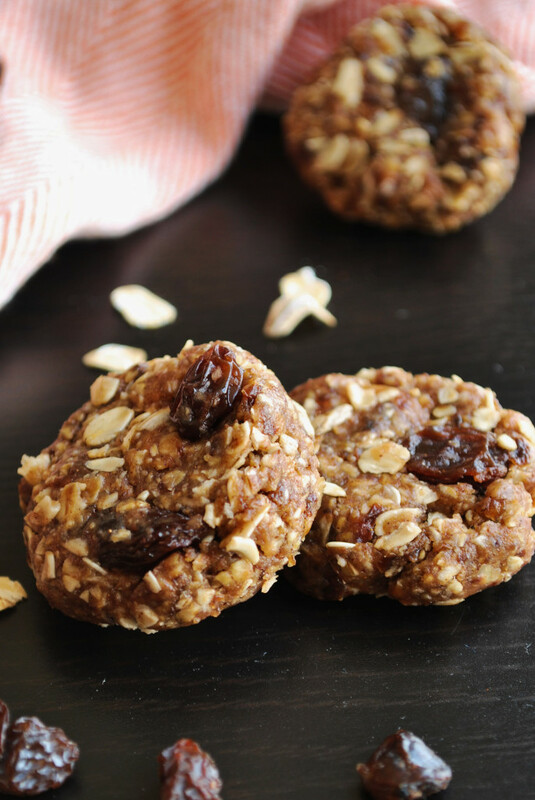 Now you have no excuse not to make these No Bake Granola Bar Cookies rightthisverysecond! And the best part? They’re COMPLETELY adaptable! Hate raisins? Throw in some dates! Want some crunch? Throw in some chopped almonds or pistachios! Not a fan of tahini? I’m sure that peanut butter or almond butter would do wonders here! Make these cookies your own, and I guarantee they’ll become a staple in your kitchen this summer! 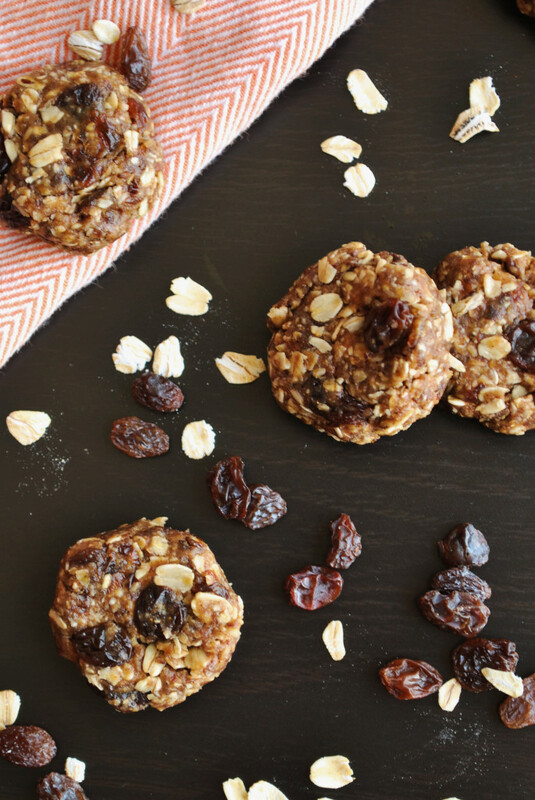 Turn that classic snack bar into a sweet treat with these No Bake Granola Bar Cookies! They're a quick and easy summer dessert! Add 1/4 cup oats, 1/4 cup raisins, nut butter, cinnamon, vanilla, and salt to a small blender or food processor and blend until it comes together into a ball. Remove mixture and set in a small bowl. Mix the remaining 2 Tbsp. oats and 1 Tbsp. raisins by hand. Shape into cookies, and place in the fridge to set. P.S. Follow me on Instagram, Twitter, Facebook, Pinterest, Bloglovin‘, Tumblr, and Snapchat! If you try any of my recipes, be sure to use #fooduzzi! I’d love to see your whole food creations! Right?! I’m glad I’m not the only one out there specializing in volume eating ;) If you’re ever in Pittsburgh, you must find a Hello Bistro – you get to create your own GIANT chopped salad with unlimited ingredients. It’s heaven! Classic and delicious! I could eat so many of these in one sitting. Yikes! Thanks so much, Dani! I am the same way – it’s a good thing that this recipe makes a small batch! These look great! I love the idea of tahini here– I never would’ve thought of that. Thank you so much, Sarah! I absolutely love using tahini! It adds such a subtle richness and nuttiness to everything! Nothing beats no bake treats in the summer… and these look so so yummy!!! Thank you so much, Jen & Emily! No bake treats are a go-to in my household in the summers! Alexa – Delish!! Makes me comfortable to give my little guy cookies because it’s all healthy! ? Yay!! I’m so happy you guys like these :) They’re so easy, and great to keep around for a quick and delicious snack! I agree! The less, the better. Your bars look scrumptious. Instead of tahini, I use some almond butter and half an orange juice in mine.